From Marilyn on 18th January 2005. Near the end of 2004 Hazle decided to move Hazle Ceramics to Barleylands to join the hobby painting classes of Hazle's Pottery Barn, operating there since September. Here was a last chance to visit Codham Hall Farm - home to the company since 1993 - and buy rare ceramics in the clearance sale. This was a very successful day with more turning up than expected. 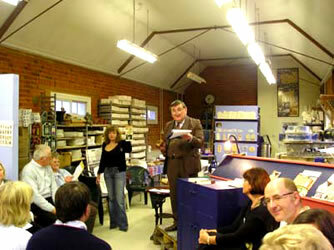 There were over 80 people by teatime, when former painters and staff joined us. It was great to meet some of these including the legendary Lois of lettering fame and Dot Canell, a painter of many early pieces and mother of Sandra Peach who still works for Hazle. I also chatted to former Club Secretaries Zena and Helen, who good-naturedly recalled me pestering her with questions when I first started collecting. For our research, Chris took the opportunity to ask retired chief paintress Chris McAllister and others to help with some unknown painter’s marks. A few mysteries still remain... and even Hazle is unable to remember all of her painters but we hope there will be a record of them somewhere. Guests were invited to wear a first-name sticker which helped us to identify group members. Except that I initially mistook Rachel Harrison for Rachel Landsman - but it was all sorted out. The Landsmans and their daughter are also shown to the right of Hazle in the Casting Demo photo below. The backs of Celia Jackman with red hair and mother Pat Crichard to her right are in front of Hazle in the Just Before the Talk photo. I finally got to put a face to Karen Dodgson who is below in a back view only! She travelled from Yorkshire with her family, and like others stayed overnight on the way. Children did ceramic painting with Cara and were thrilled with their creations. Juliette, daughter of the late Philip Hastings, brought a few pieces to be auctioned for charity. Due to other commitments she could only stay for a brief period in the morning. But several of us enjoyed talking with her, hearing about her work as a horticultural therapist helping psychiatric in-patients grow their own plants. Collectors from Connecticut were visiting the UK at just the right time for this event. They will hopefully join the group on their return to the US... The Australian Osbourne sisters, who live in the UK, already have! Had there been a prize for the longest specially-made journey, it would have gone to Günther from Vienna. 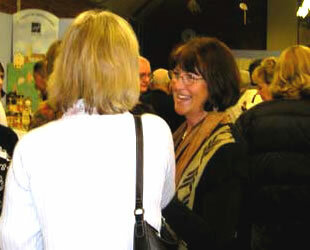 After hot drinks and biscuits the fixed-price prototypes, samples, unusual colourways and other oddments were unveiled. A good selection carried the full (pre-1993) Hazle Boyles signature on the front. Although you could buy other ceramics, there was a limit of two from the HB and prototype sections until after Hazle’s talk. There was a lot of stuff and it was hard to choose. And at the very beginning when everyone crowded round it could be difficult to see too! Prices ranged from under £40-120. I think most people went home with something a bit different to add to their collection. 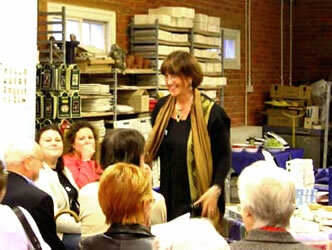 At 12 noon, with the majority seated, Hazle started her talk. Stephen was in attendance as assistant for a casting demonstration. I asked if the double act would include him being sawn in half - but not this time! Most famous ceramic makers started as an employee of a company, where they were inducted into the processes and materials involved. Apart from spending a summer holiday whilst still a teacher working for free in a Stoke pottery, Hazle learnt from her own trial and error. Various models from the earliest kitchen sink and bathtub experiments were passed round so people could see how much had changed over the years. The actual painting is much more important now, a development that Hazle is very happy with. 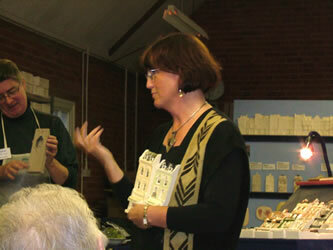 She compared both models of the Cambridge Bookshop building, primarily painted as Old Bookshops. The greater symmetry in the later, narrower model which had a central but no side door, put more focus on the Gothic windows. Slip casting, where a mixture of water and clay is poured into a mould, was first developed 250 years ago and is very much an English product. The slip is left for several minutes to set when it becomes greenware - which is actually brown! This is extremely fragile and the mould has to be specially designed so that the greenware is not torn apart when removed. Everything is modelled at a slight angle and there are no sharp corners. Hazle said that clay really wants to be a pot and her process does exert a kind of ‘stress’ onto the medium. The greenware takes two days to completely dry out whereupon it is fettled with a sharp knife to remove any extraneous bits before firing. The resulting bisque is then painted and glazed before being fired again. Gold requires a third firing at a much lower temperature. The shrinkage from firing the stone ground china is normally around 10% - compared with 15-18% for bone china. But Hazle showed us a big variation in bisque size using the same mould with different types of clay. Someone asked about the working scale which is approximately 1:66. When a mould is slightly altered, as in some Jubilee Parade and 10th Anniversary pieces, this is done from the working rather than master mould. Because of the high level of modelling in Hazle Ceramics, working moulds last a maximum of 40 castings, vastly fewer than with other cast items. Hazle’s talk reminded collectors just how much work goes into every ceramic and how special it is to have such a labour of love product still made in this country. Much of the casting bay had been removed to create space for lunch. Some helpers brought delicious warming soups from home, supplemented with bread rolls, cheeses, pates, chutneys, tomatoes and grapes - a true ploughman’s lunch in an authentic farmyard setting. The hand-made treats continued with a great choice at teatime including lovely moist banana/cherry bread or coffee cake with buttercream. After lunch about half the collectors dragged themselves away to see this amazing rural church, a few minutes drive from the workshop. Churchwarden Peter Proud certainly lived up to his name when he showed us round! Photos and details below. We got back just in time for the auction - but I don’t think they would have started without us! The auction pieces sit behind Hazle in the two Demo photos above. The cheapest item went for £45 and the most expensive for £350, with the majority selling between £75-150. Hazle has never auctioned pieces on this scale before but it was felt to be the fairest way for many rarer things. 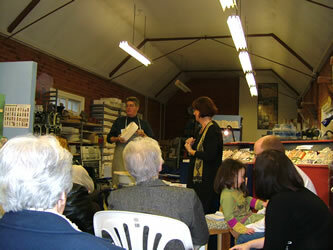 Iona held up the ceramics while Adrian Rilstone, company accountant, was the auctioneer - and got a bit lost at times! Karen and John Dodgson are in the front row - to the left of Hazle. And collector Rita Weller and her husband are to the left of Iona. All donations for food and drink went to charity. By the end of the afternoon together with monies from the raffle and some auction ceramics the impressive sum of £1000 was raised. The proceeds will be shared between the Tsunami Appeal and the Ombili Foundation. The latter supports Namibian bushmen and their families who are unable to follow their former hunter-gatherer way of life because of government conservation laws. They are now trained in farming and craft making techniques, with schools for the children. This was a cause close to the hearts of Philip and Anne Hastings. If you stayed long enough you would have seen young Adam Dyer outside attacking with great gusto the huge and heavy master moulds of Marks & Spencer’s and Boots from Hazle 2000. He wanted to spend longer at the church but returned with his parents for the auction. This was the perfect way to vent his frustration! Many thanks to everyone who put so much into the planning and helping including, in no particular order: Sharon, Sandra, Carol, Cara, Toby (Cara’s dad), Michelle, Judy and Iona plus of course Hazle and Stephen. Thanks also to Karen and John Dodgson for providing all the photos above and most below. These were added on 27th May 2007 when the text was edited too. 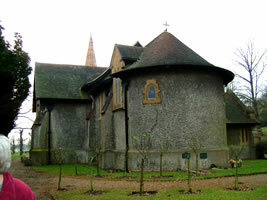 "Consecrated in 1904, this Grade I listed building is unique in that it possesses the only art nouveau-style church interior in the world. 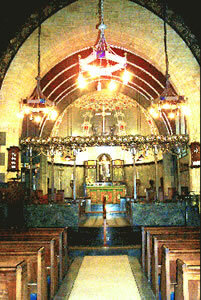 The interior was designed by Sir William Reynolds-Stephens in the very latest style and purest form of art nouveau. 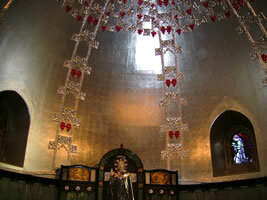 Features include a mother-of-pearl frieze, carved screens and a copper pulpit. 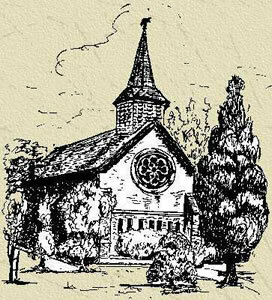 Lucinda Lambton, who visited the church for her Alphabet of Britain television series, said ... there is no richer and rarer church in Britain." 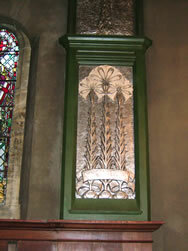 Above right, the marble is visible and trees of life along the rood screen reflect light. I don’t think anyone had seen anything quite like this before! Apart from the marble, mother of pearl and walnut woodwork, a big surprise was just how much aluminium, copper and other metalwork there is inside - on the walls, the ceiling, the organ and the altar - all carved or wrought with natural motifs from the Art Nouveau period. Our guide Peter explained that the decoration aimed to bring people to God by celebrating his creation. Far from being a museum the church is still regularly used for worship. 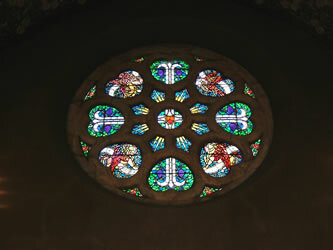 During the Second World War many windows were blown out by a bomb but the beautiful large Rose Window below, with its vibrant forms and colours, is believed to be authentic. Some windows were replaced with Victorian-style stained glass and others are copies of the originals. 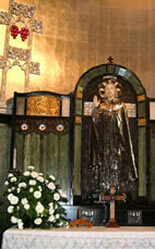 The altar below is very elaborate - green was a popular Art Nouveau colour. 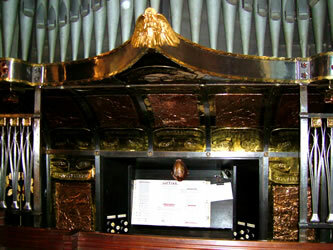 And even the specially designed organ is embellished with metallic motifs and carvings. From one Arts and Crafts labour of love movement to another... 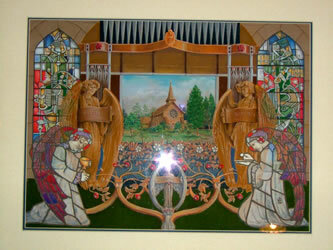 In 2004 Hazle Ceramics commissioned a painting for the church’s centenary with the plain exterior surrounded by images of the decorative interior. It sits on an easel in front of the altar. 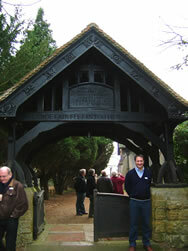 John Dodgson stands to the right of the gate with Barry Davies on the left.